Chain O’ Lakes State Park, Indiana was a second choice vacation for us. We had a week-long trip booked for Upper Michigan, but had to cancel when van repairs went over budget and ate into our trip account. However, Chain O’ Lakes didn’t feel like a second choice once we got there. We had a fantastic three-night, two-day adventure in the state park. 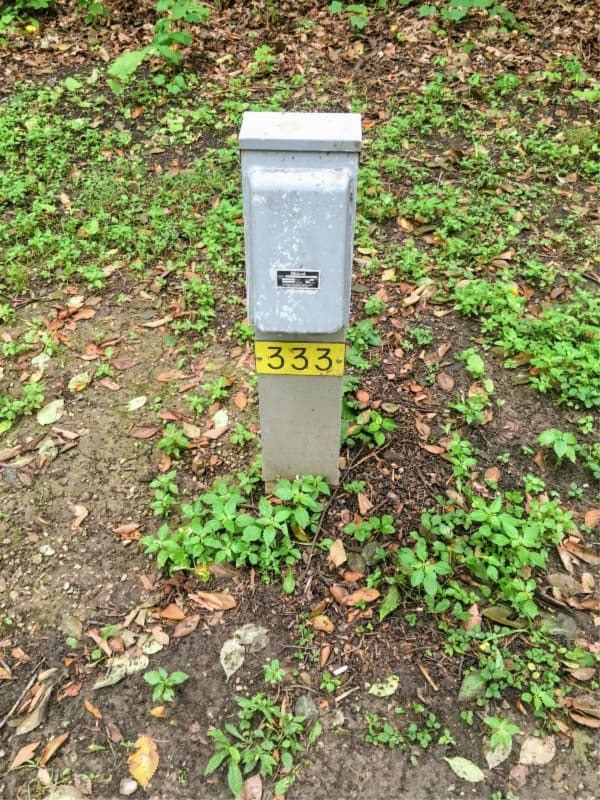 We had campsite number 333. 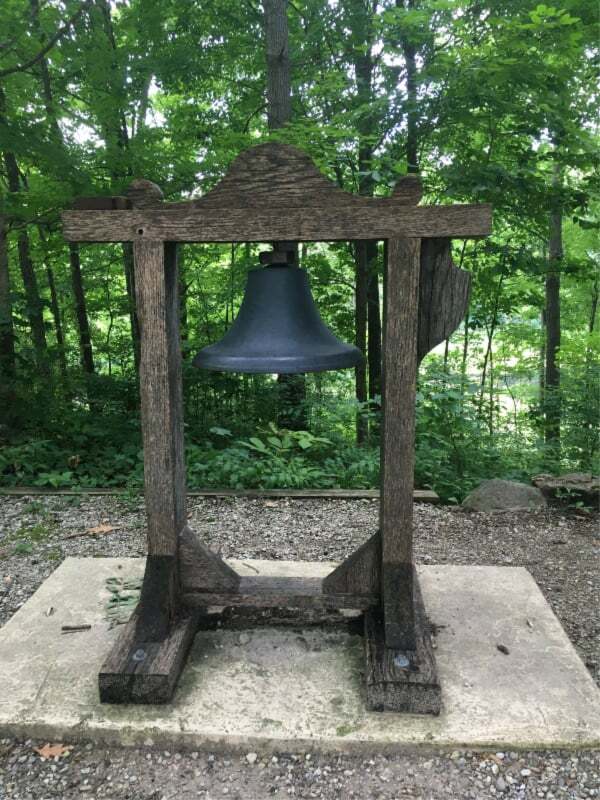 There are over 400 campsites in Chain O’ Lakes State Park. Most sites have electricity. There is no water at the sites, but you can fill up your tanks at one of the several water spouts in the campground before parking your RV. There is also no sewer at any of the campsites, but there is a dump station available to use on your way out of the park. RV camping tip: always have disposable gloves and wipes like these available to make sewer dumping less icky. 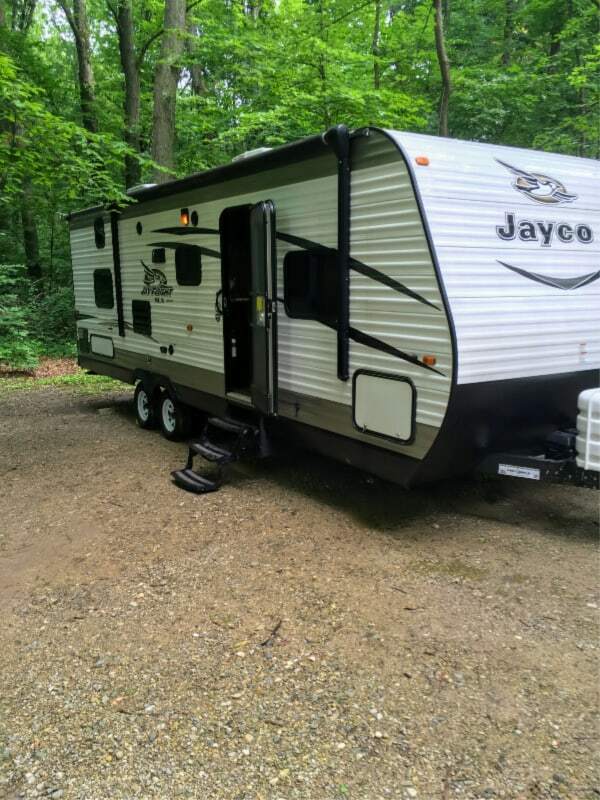 Our Jayco is 28 feet long and it fit well in the site. 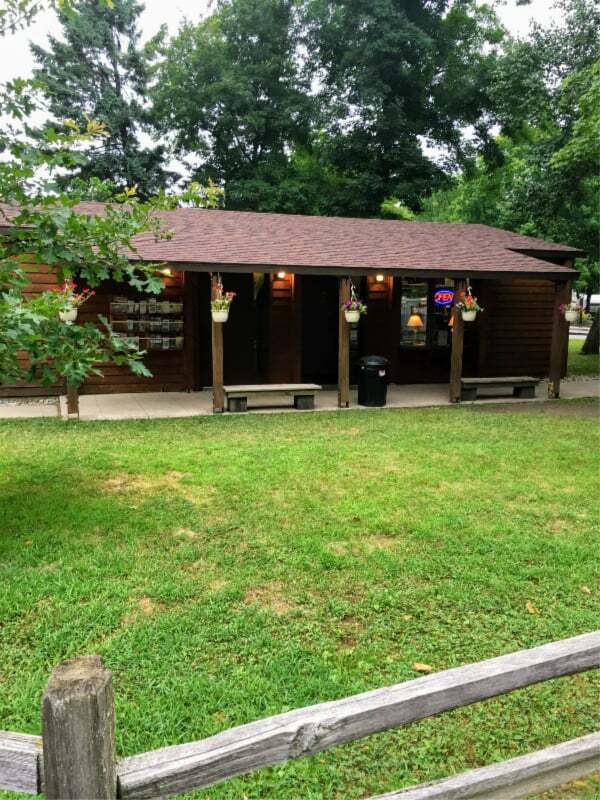 Chain O’ Lakes State Park Campground has a wide variety of sites with some able to fit 60 feet. Do they even make RVs that long? Site 333 had lots of shade and was reasonably flat. We did have neighbors on both sides of us during our stay, but the sites are plenty wide enough to make it feel like you are not invading each other’s space. RV camping tip–wheel stabilizers make a world of difference when it comes to trailer movement. 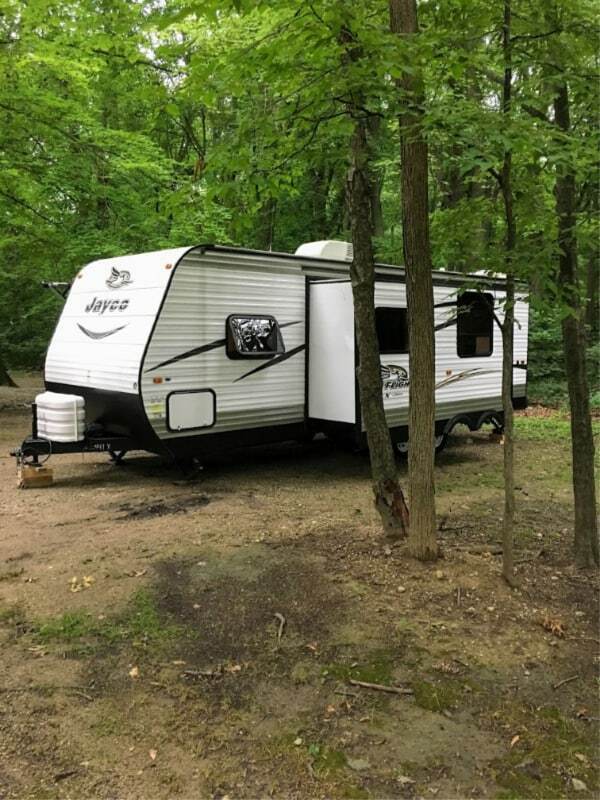 We bought this kind when we went on our 5 1/2 month trip with our three children and we are so glad we did–they cut down on trailer movement caused by having five full-grown people moving around in the trailer. 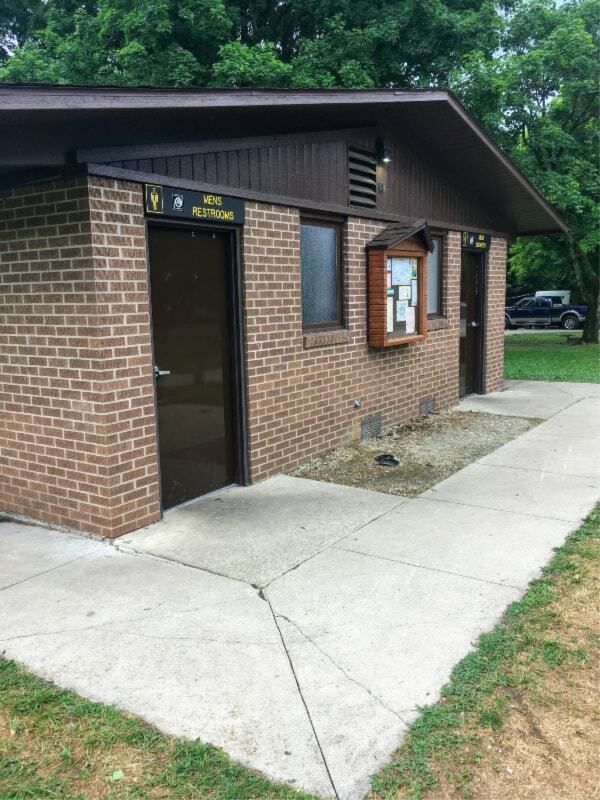 There are several bathhouses in the campground and a few pit toilets. The bathhouses were a bit outdated but clean and functional. I found the shower stalls on the narrow side, but they got the job done. We tend to use the campground showers if we don’t have water hook-ups and are staying for several days. The camp store was by far the best camp store we have ever seen. It was well stocked with every item a camper might forget and the prices were not outrageous. I bought a waterproof bag for my iPhone so that I could bring it on our canoe rides and it was only perhaps a dollar or two more than I would have paid at Walmart, and that would have required us using gas and time. The staff was friendly and helpful. They knew as much about the park as the park rangers did and if they didn’t know something, they knew where to find the answer and were willing to get it for you. 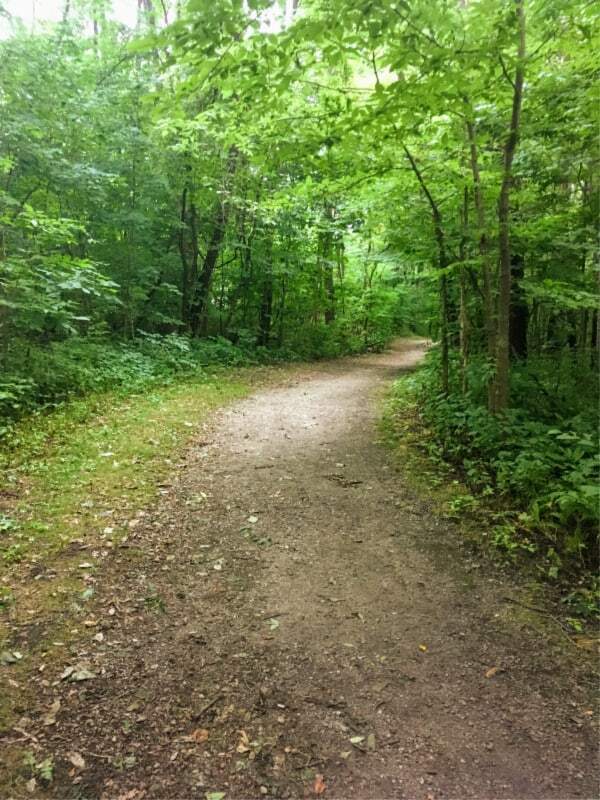 There are over 20 miles of hiking trails within Chain O’ Lakes State Park. During our two-day, three-night stay we managed to hike all but four and a half miles of that. The 20 miles are divided between 12 different trails. We walked all but trail 11. 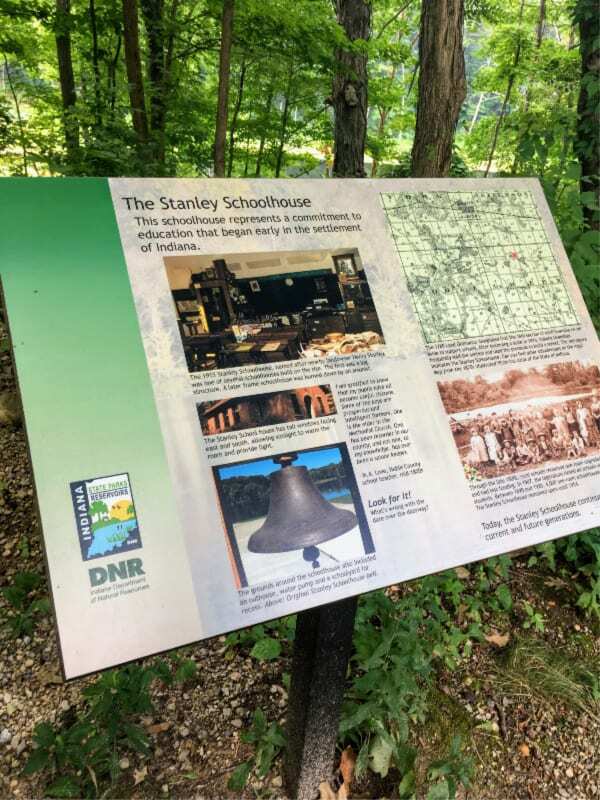 The trails were well marked in most areas, but we did get a bit confused on the trails that start near the northeast corner of the park, where the Stanley Schoolhouse is located. There were some unmarked trails particularly on paths one and two that made it hard to decide which one was the trail on the map and which was a trail that wasn’t in the trail marked system. Hiking tip–We bought this small, rugged sling pack for day hiking. It holds a few water bottles as well as snacks and our wallets and still has more room for other hiking essentials. It is very comfortable and easy to get off and on. 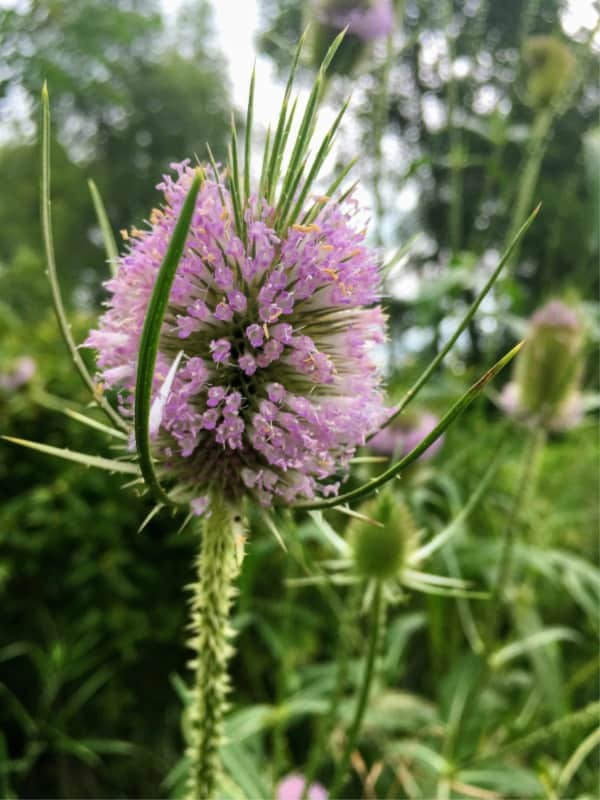 What I loved most on the trails was the beautiful assortment of wildflowers. We were there in mid-July, and they were everywhere you looked. 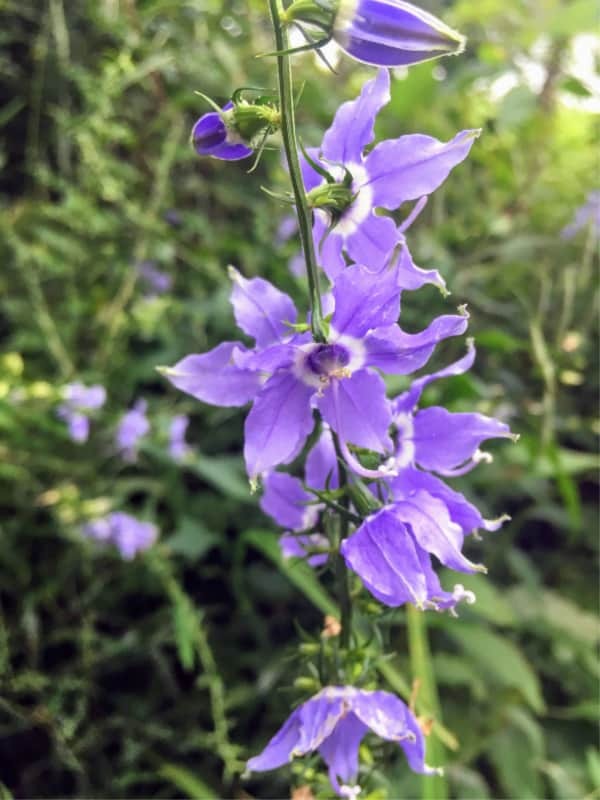 These pictures below are just a small sampling of the beautiful blooms we saw along the sides of the trails. 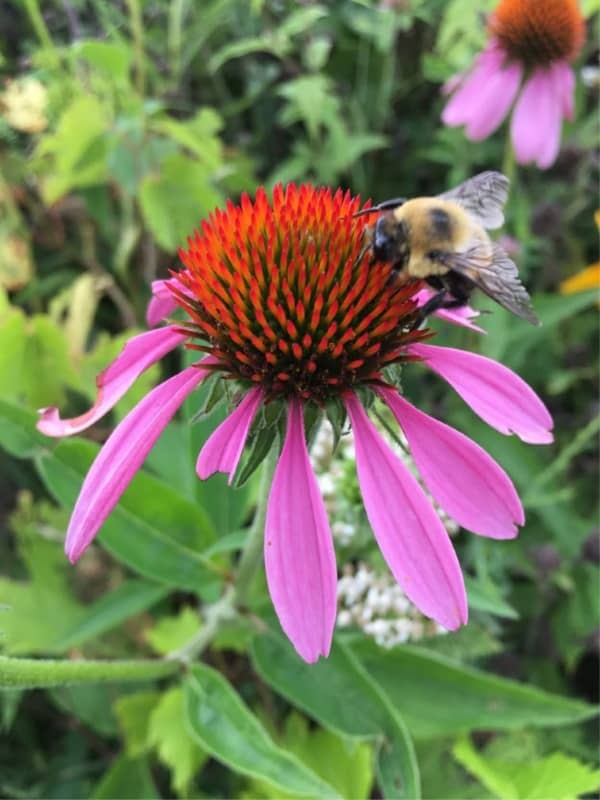 I wish I could say I set out to get this picture of the bee on the flower–but I didn’t. 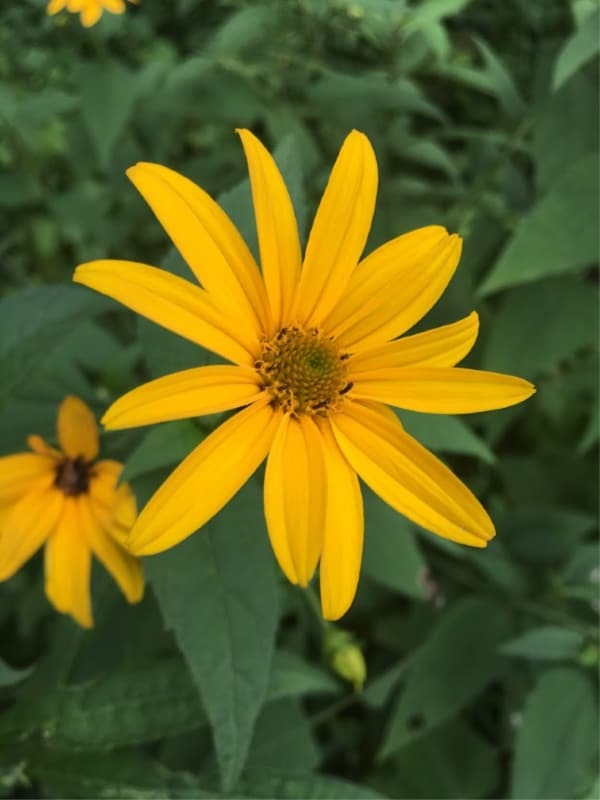 I was getting into position to take a picture of the bloom when in flew a bee landing perfectly in my photo. 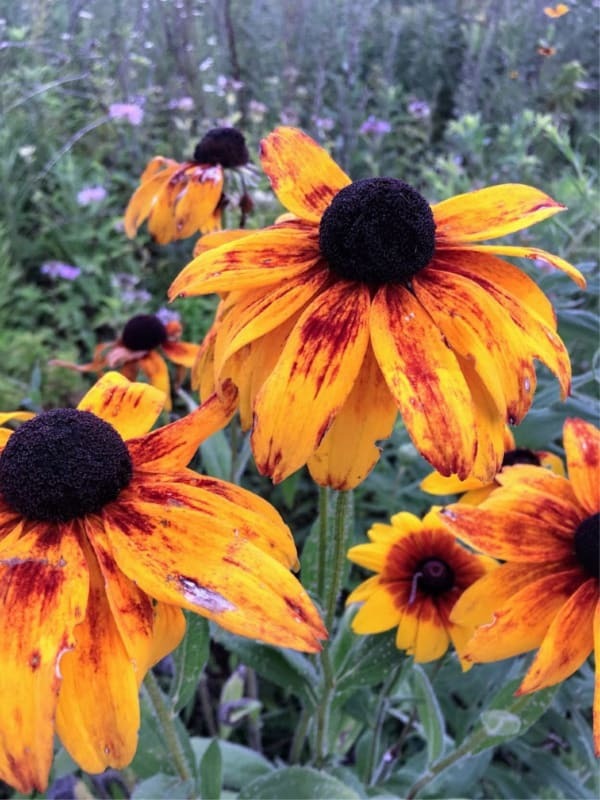 I want to get to know the names of all these flowers. 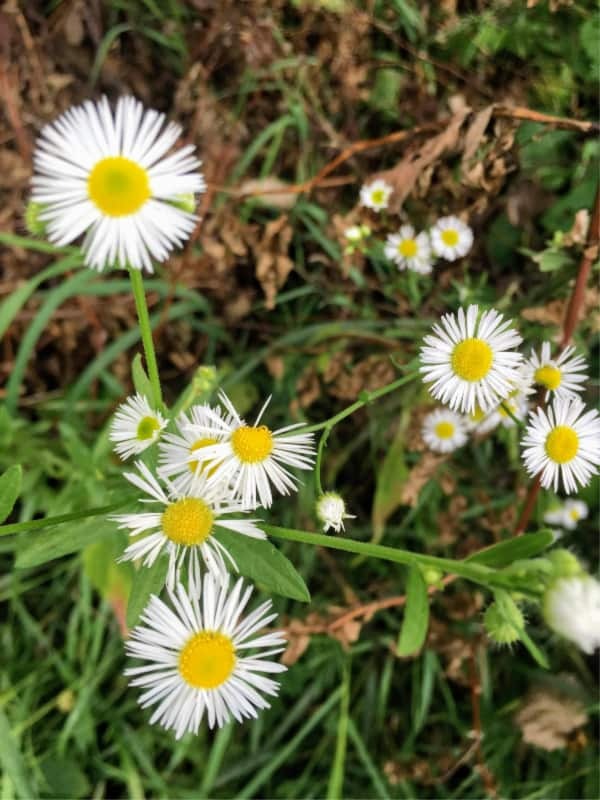 I am sure some are probably considered weeds, but they were all beautiful to me. 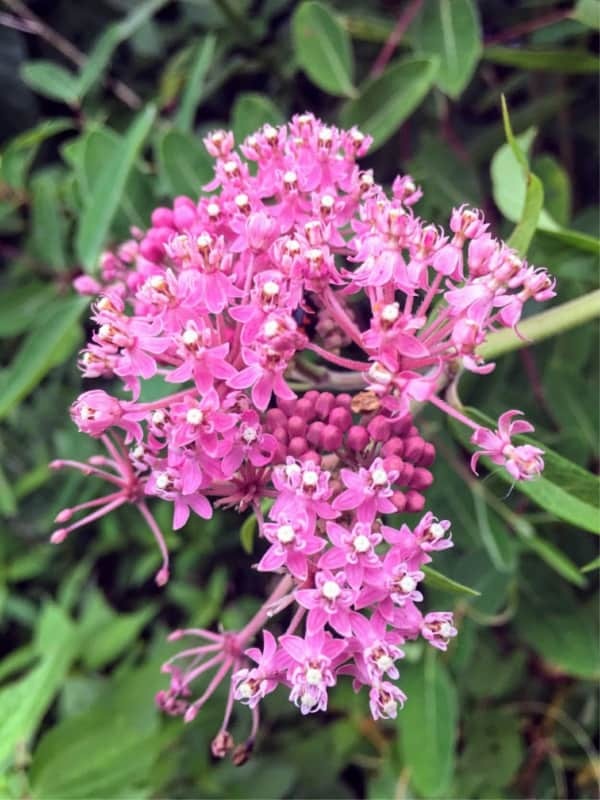 I wish my butterfly shot was as good as my bee on the flower shot–or is that a fancy moth? I need to study up on flowers, insects, and birds. 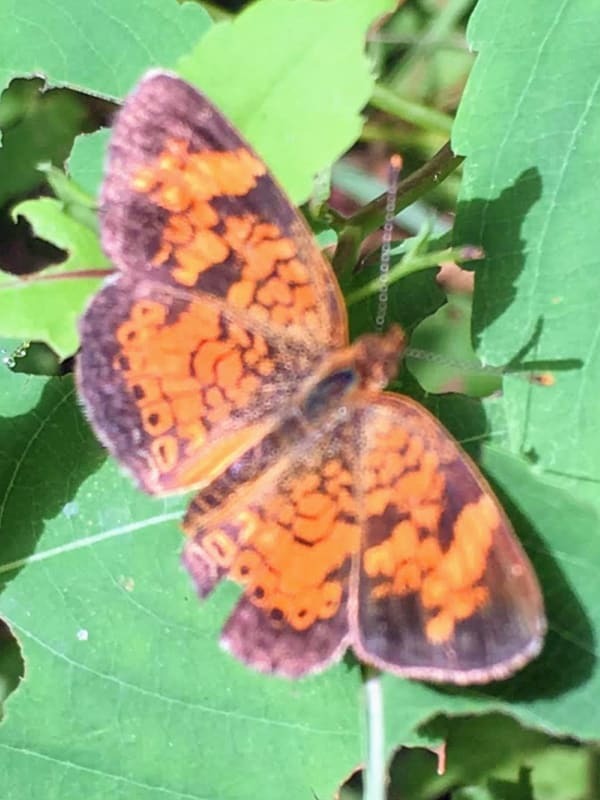 Anyways, I tried over and over during our trip to get a beautiful picture of one of the monarch butterflies flying around everywhere, but I kept missing them so I had to settle for a slightly out of focus shot of a little butterfly (or moth?). Frogs were also numerous in the park. It rained a short while both days we were there and that meant that in some areas the trails were a bit wet. Whenever we stepped into areas of wet grass dozens of tiny frogs no bigger than a quarter would start jumping out of the way. 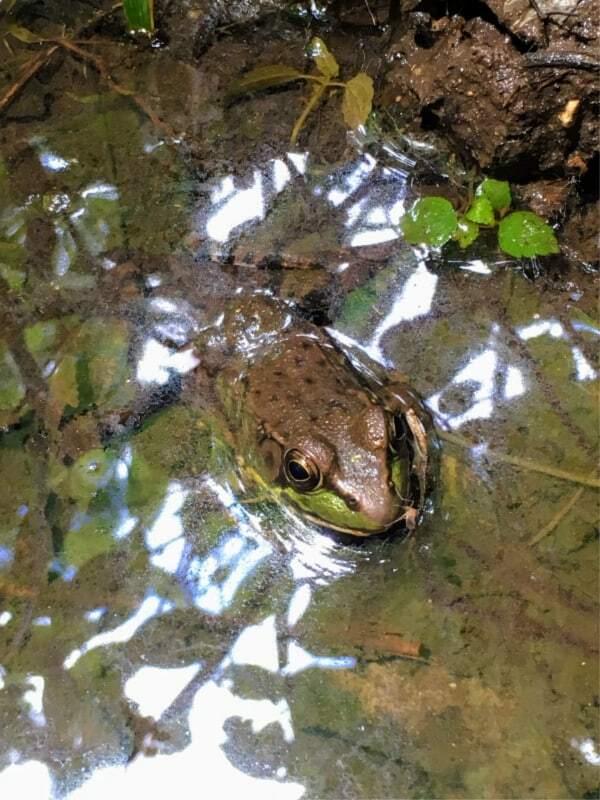 In deeper puddles we would find larger frogs like this guy above. We also saw bunnies and cranes–both moved too fast to be photographed by me. 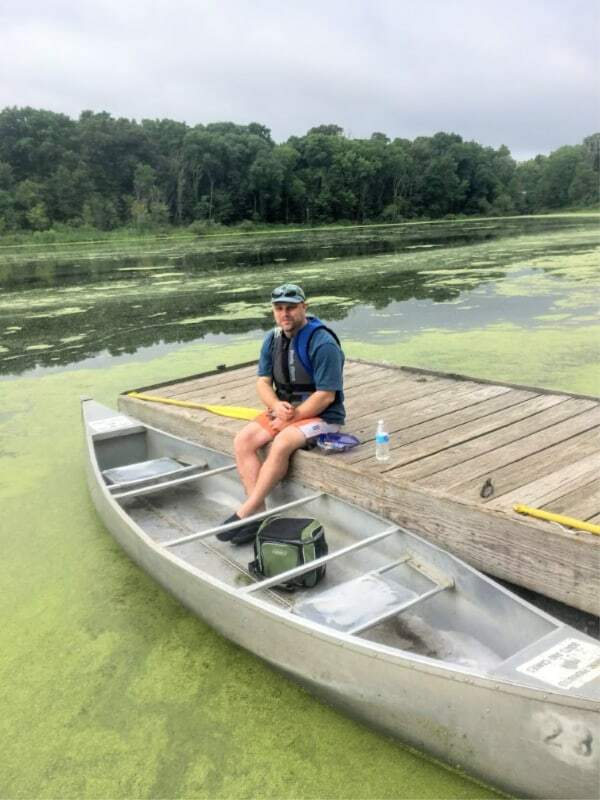 The main attraction of Chain O’ Lakes State Park isn’t the trails though, it is the system of small lakes that provide tranquil views from various spots of the trails. 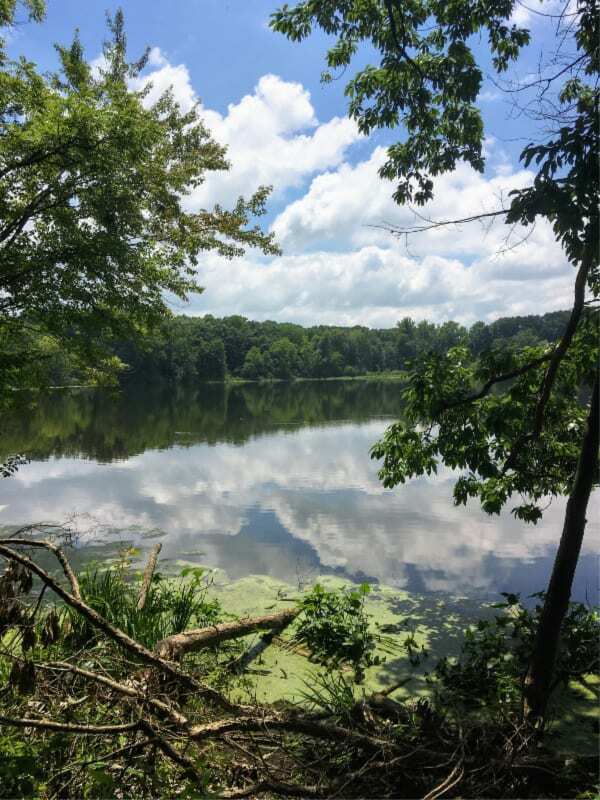 There is a total of thirteen small lakes in the State Park. 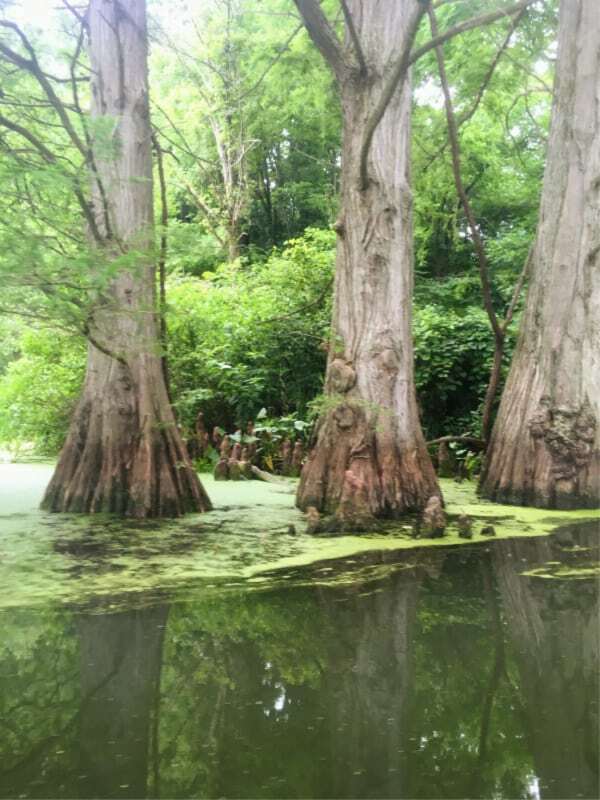 Nine lakes are in a chain like formation joined together through narrow passageways–hence the name Chain O’ Lakes State Park. 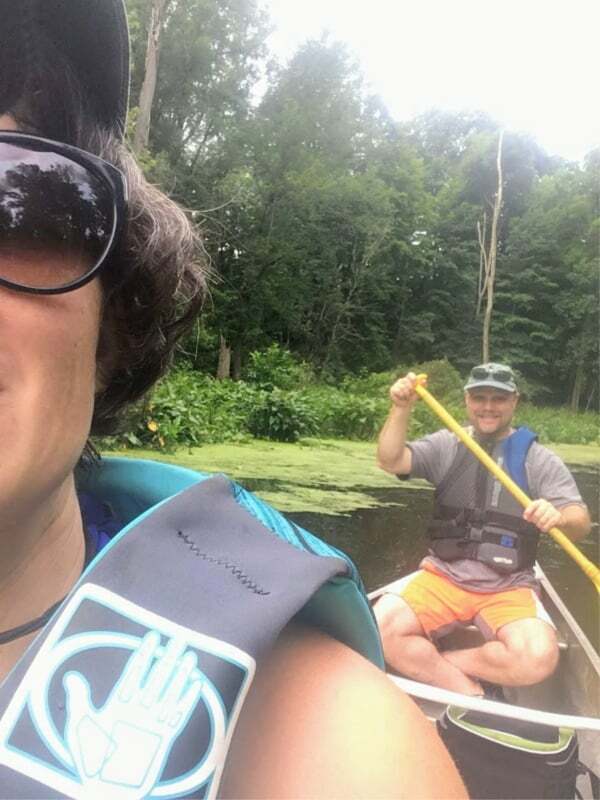 We had brought our sit upon kayaks so that we could get out on the water and explore the lakes, but when we saw that you could rent a canoe for just $5 an hour or $20 for the entire day, we decided that this was the perfect opportunity to see if we liked canoeing together. It turns out we loved it! Although we like how simple it is to throw our sit upon kayaks in the back of the truck and then in the water at our destination, we found the canoe encouraged our teamwork skills, held a cooler with cold drinks and snacks easier, and we got less water splashed on us. 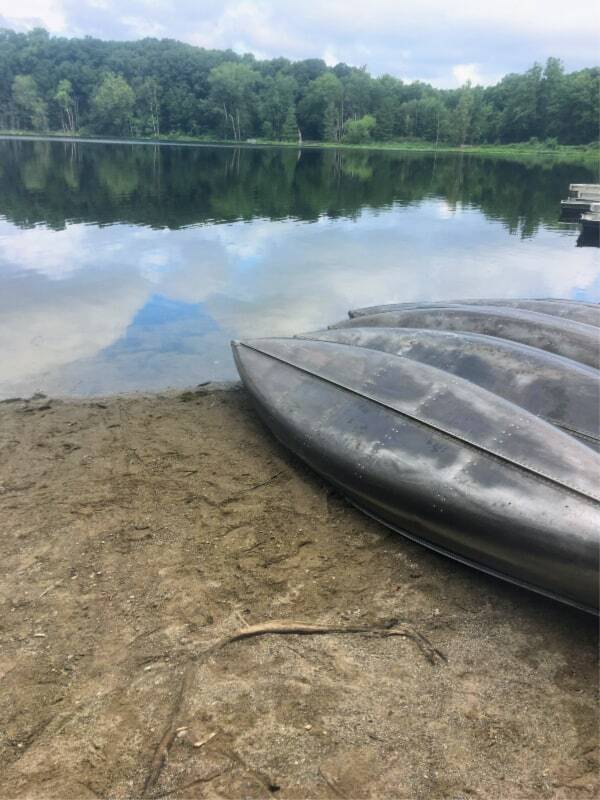 The rental station for the canoes is found on the shore of Sand Lake which is right smack in the middle of the chain of lakes. We decided to break up canoeing all the lakes into two days and went east out of Sand Lake the first day traveling through Bowen Lake, Dock Lake, and Long Lake. We tried to go to the last lake of the chain, Sucker Lake, but there was a logjam that made it impossible to get through the passage to the lake. It took us just under two hours to canoe the route round trip. In this picture we are wearing our own life jackets, but the park does provide life jackets with the $5 an hour rental, which makes it an even sweeter deal. You can also rent kayaks for two people and paddle boats. 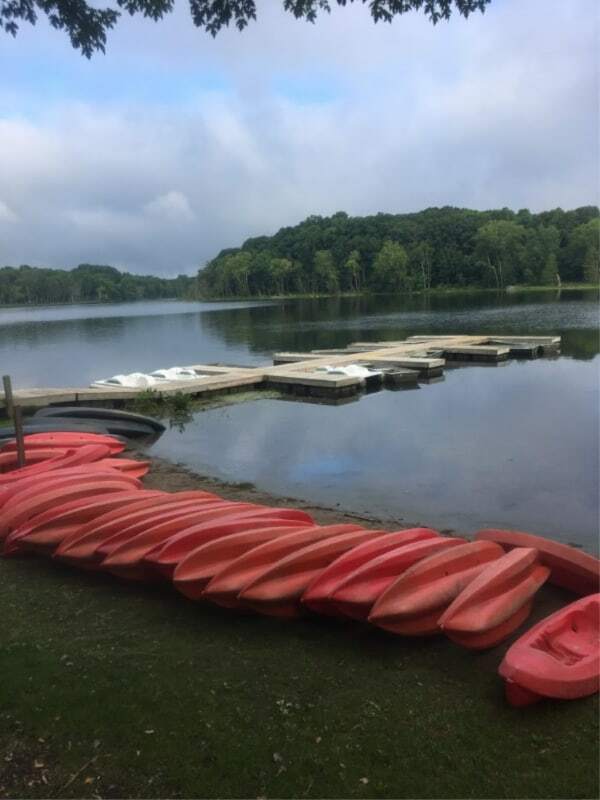 Paddle boats can only be used on Sand Lake, but both kayaks and canoes can be used on all the lakes and passages in the chain. The second day we headed westward from Sand Lake, through Weber Lake, Mud Lake, Rivir Lake, and we arrived in Miller Lake. Weber Lake was clear, but the passageway to Mud lake had an inch thick crust of what looked split pea soup before the split peas turn to mush. 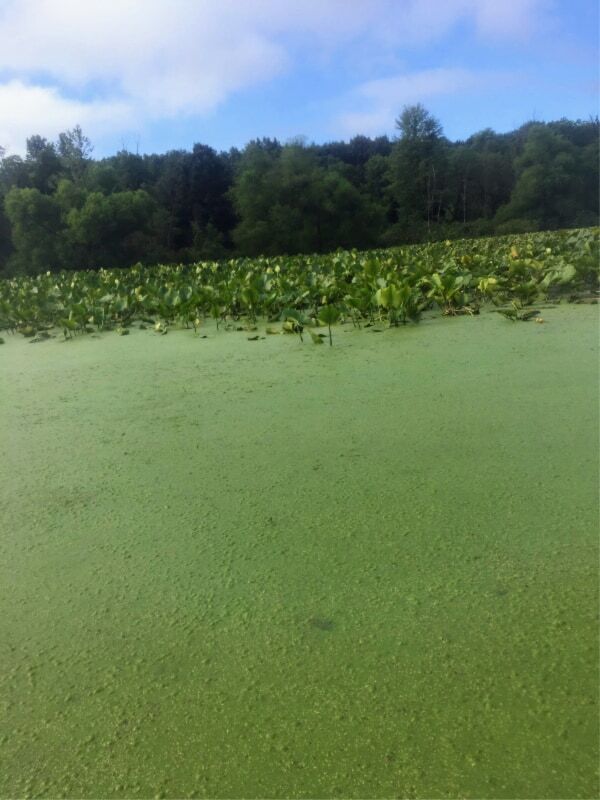 It made for some difficult paddling; I think it took us 45 minutes to get through the soupy mess. When we arrived at the dock at Miller Lake, our arms were pretty worn out and we still had to make the trip back. We got out of the canoe, had a snack and walked around a bit before heading back. I couldn’t get over how unusual the bottoms of these trees were in the water heading out of Miller Lake back towards Rivir Lake. 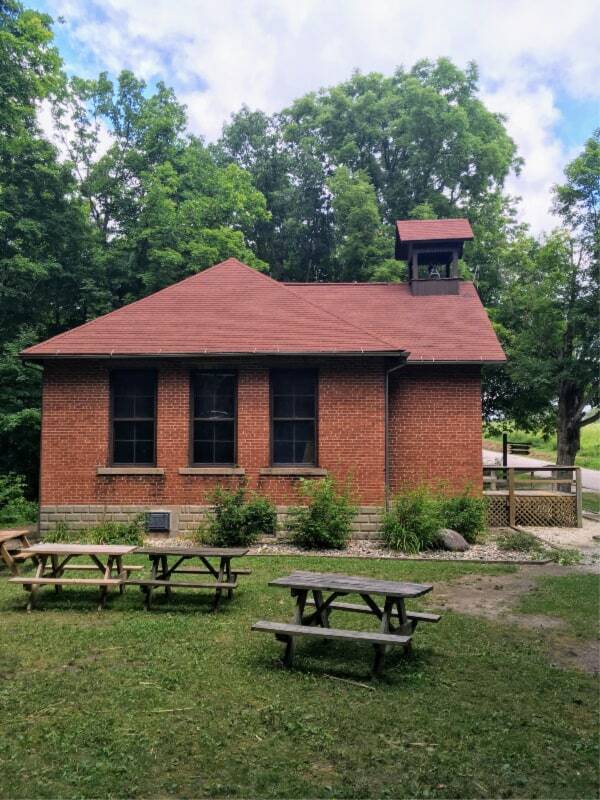 One last thing you need to check out if you go to Chain O’ Lakes State Park in Indiana is the Stanley Schoolhouse. 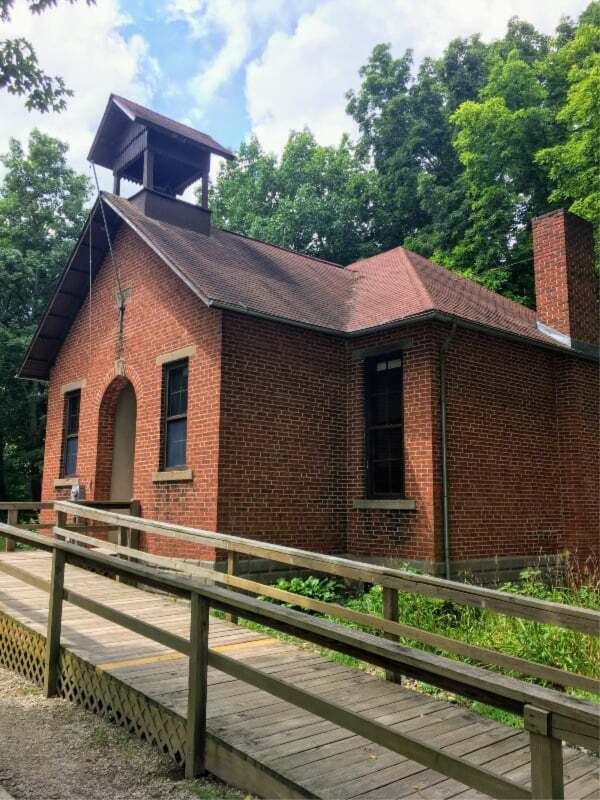 Not only is the outside in great shape, but the inside is set up just like a one-room schoolhouse would have been back when it opened in 1915. You can view the interior of the building by looking in the front door windows. If you are interested in going inside, the schoolhouse is open during weekends from May through October. After two full days in Chain O’ Lakes State Park, we were left wishing we had booked just one more day. 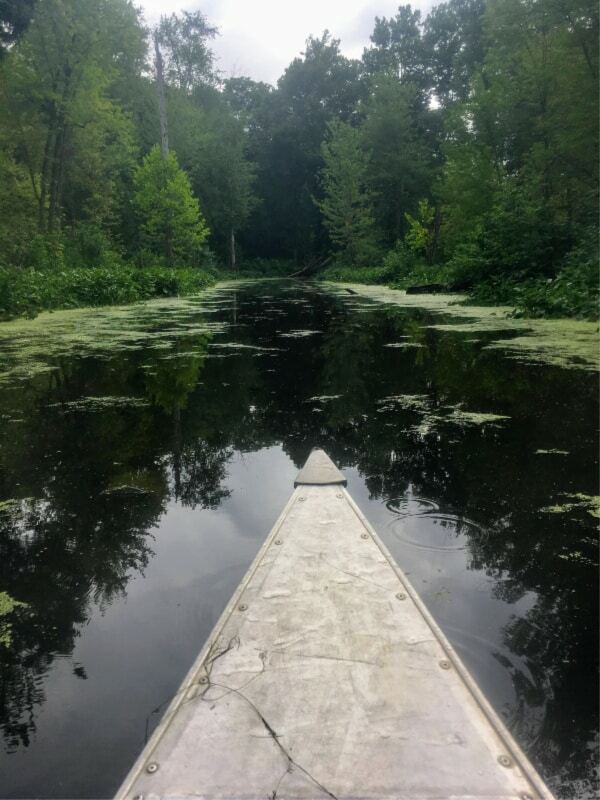 It would have allowed us to finish off the twenty miles of trail as well as enjoy a paddle boat ride around Sand Lake. 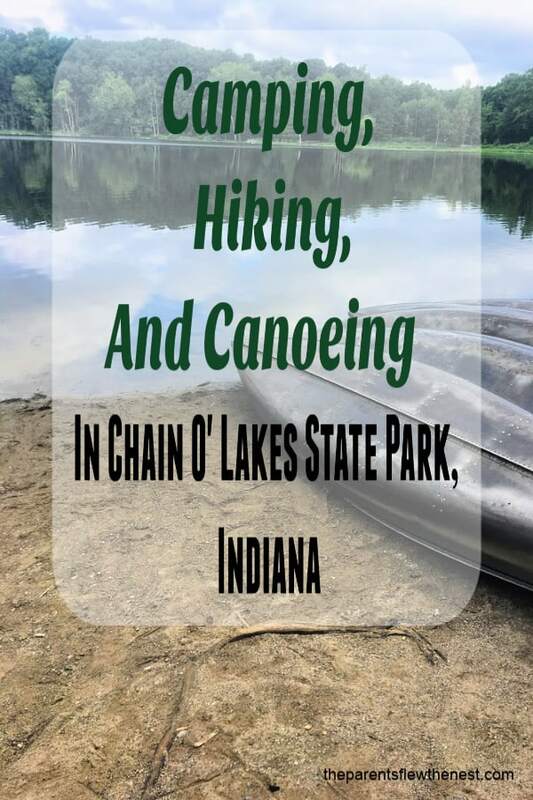 If you plan a camping trip to Chain O’ Lakes State Park in Indiana, I suggest booking four nights so that you have three full days to explore everything the park has to offer.